4Wayne State University, Detroit, USA. Received May 8th, 2011; revised August 29th, 2011; accepted October 2nd, 2011.
decrease in militancy. The implications of the results were discussed. nance and reproduction of political conflict (Kira, 2002, 2006). e.g., Bandura, 1997, Kira, 2002, 2006, 2010). domestic violence, which may rearrange the salience hierarchy. militancy to protect such identity (cf., e.g., Ibn Khaldûn, 1968). and/or militancy, when action is called for. each case, mortality concerns become dormant. identity goals (Kira, 2002, 2006). developing highly politicized collective identity. this paper will be on West Bank participants (N = 438). portant and relevant at the time as separate probe questions. obtained or offered by participating schools and research team. other measures than those utilized in this presentation. Gaza and West Bank participants separately. used to conduct all the statistical analyses. ance. Table 1 represented the two orthogonally rotated factors. males M = 19.89, SD = 5.09). scales have adequate reliability and construct validity. assumptions and check its predictive validity. agency is at the core of identity commitment and militancy. suicidality, mental health variables, and militancy. 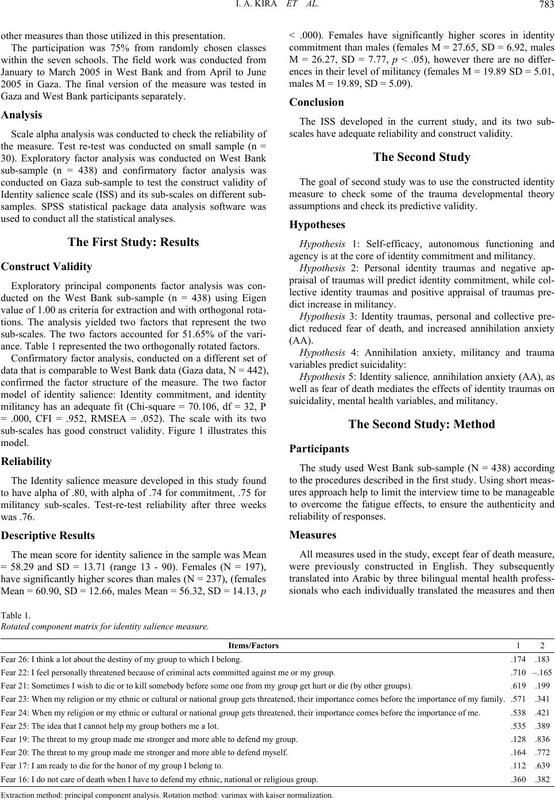 Rotated component matrix for identity salience measure. 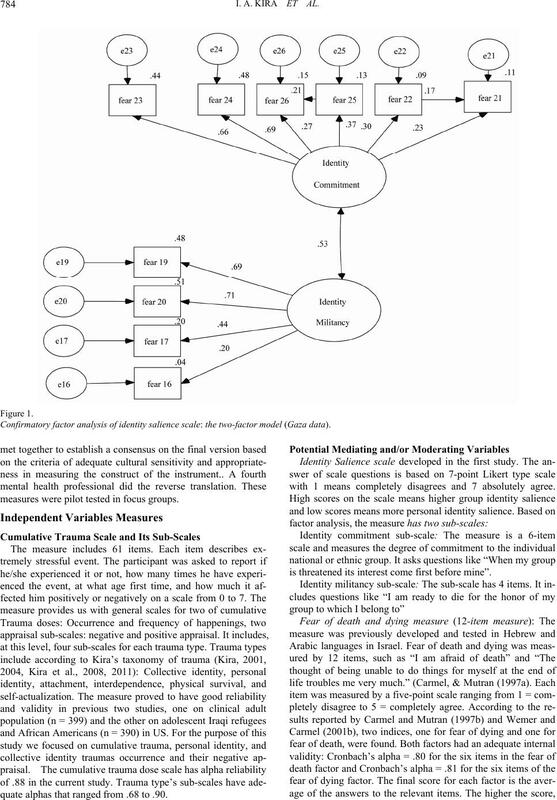 Confirmatory factor analysis of identity salience scale: the two-factor model (Gaza data). measures were pilot tested in focus groups. quate alphas that ranged from .68 to .90.
with 1 means completely disagrees and 7 absolutely agree. is threatened its interest come first before mine”. actual death. It has alpha of .80 in current study. of .91 in the current study. study (e.g., Kira et al., 2011). between physical arousal and symptoms of generalized anxiety. by Kira and associates in three studies on Iraqi refugees: Kira. scale will be used especially to test some of our hypothesis. trolling for age, gender, family size, and grades. the direct and indirect effects of each variable in the model. predictor of both (Beta = .398. for CIC, and CIM, beta = .328). which confirm one of identity theory theory’s assumptions. 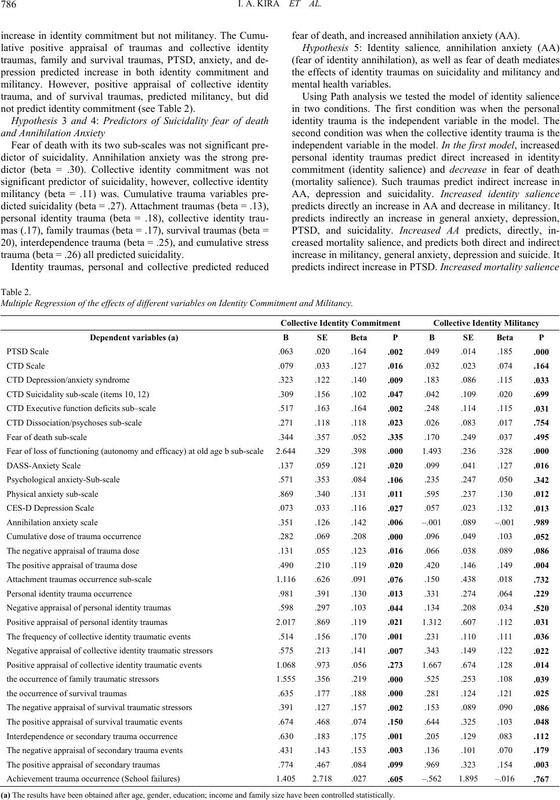 not predict identity commitment (see Table 2). trauma (beta = .26) all predicted suicidality. fear of death, and increased annihilation anxiety (AA). Multiple Regression of the effects of different variables on Identity Commitment and Militancy. (a) The results have been obtained after age, gender, education; income and family size have been controlled statistically. independent variable in the model and its significance. 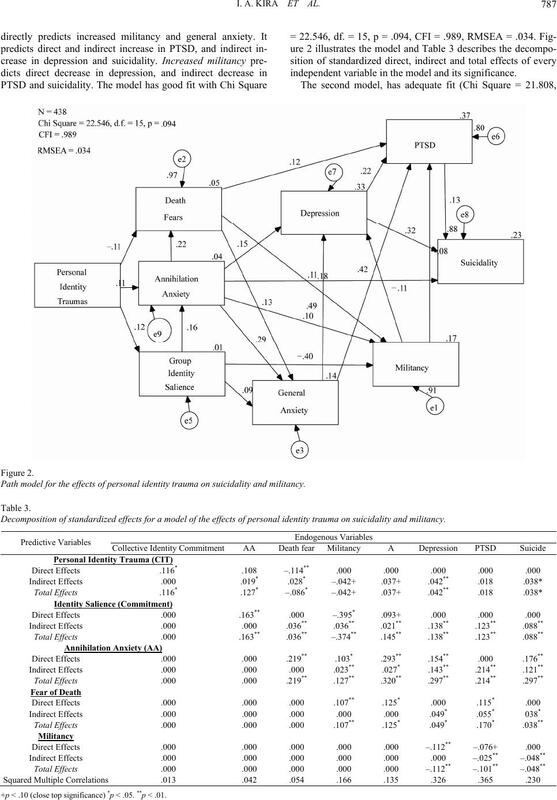 Path model for the effects of personal identity trauma on suicidality and militancy. 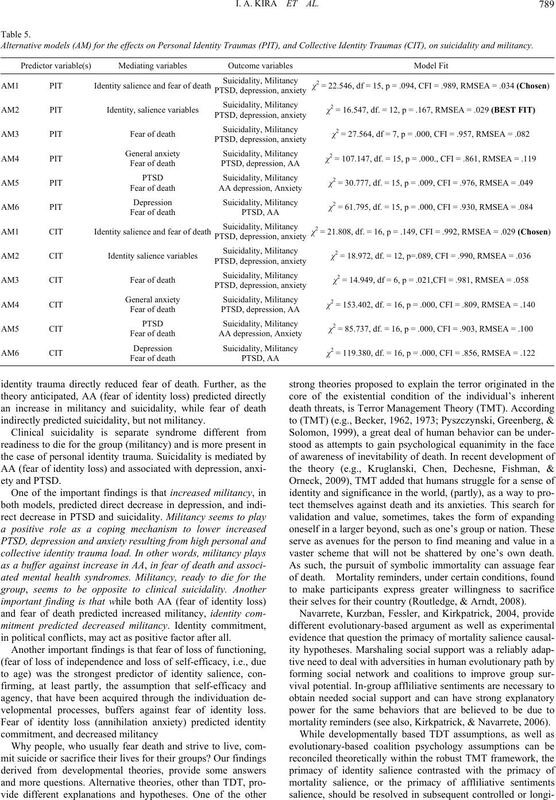 Decomposition of standardized effects for a model of the effects of personal identity trauma on suicidality and militancy. +p < .10 (close top significance) *p < .05. **p < .01.
crease in militancy, general anxiety, depression and suicidality. in suicidality. Increased PTSD directly predicts suicidality. and anxiety, as a mediating variables, the model fit get worse. to explain suicidality and militancy. tive is another dimension of adolescent and adult development. death) increasing the suicidality and to some degree militancy. decrease fear of death; it actually increased it in both models. 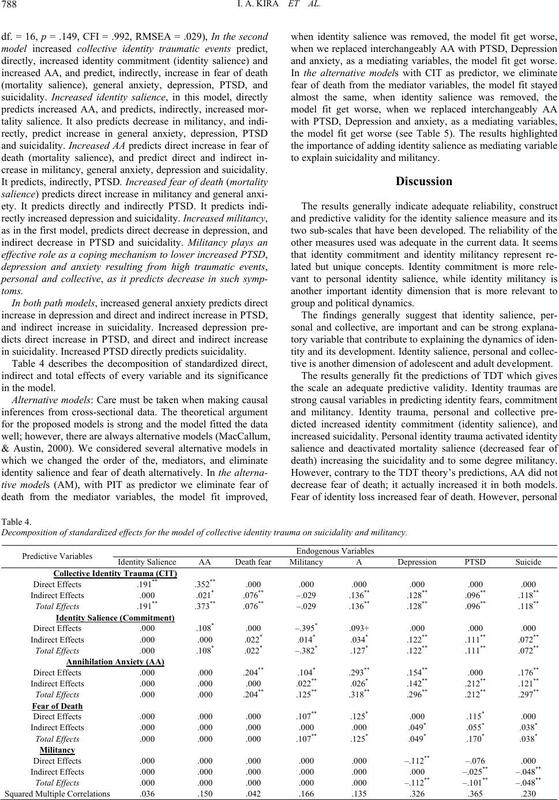 Decomposition of standardized effects for the model of collective identity trauma on suicidality and militancy. 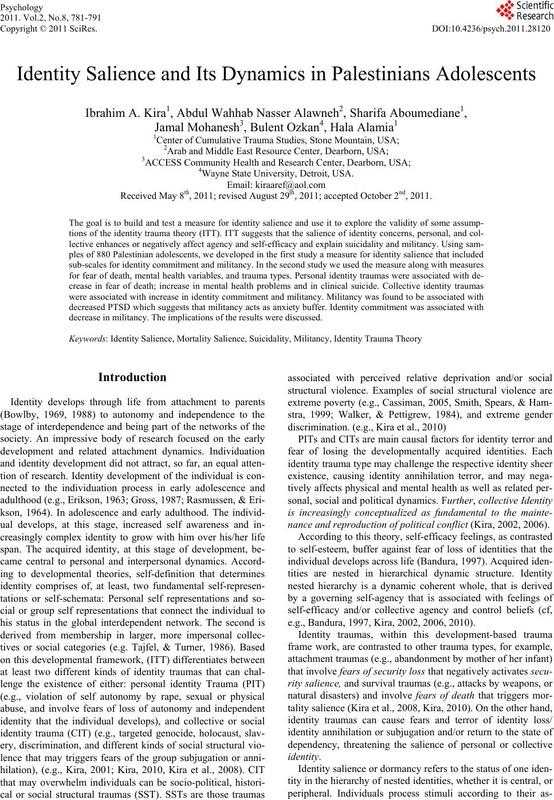 Alternative models (AM) for the effects on Personal Identity Traumas (PIT), and Collective Identity Traumas (CIT), on suicidality and militancy. indirectly predicted suicidality, but not militancy. in political conflicts, may act as positive factor after all. velopmental processes, buffers against fear of identity loss. vaster scheme that will not be shattered by one’s own death. their selves for their country (Routledge, & Arndt, 2008). mortality reminders (see also, Kirkpatrick, & Navarrete, 2006). resolution and reduce or eliminate terror. personal and collective identity traumas for such populations. to confounding variables. One caution should be made here. Antony, M. M., Bieling, P. J., Cox, B. J., Enns, M. W., & Swinson, R.
community sample. Psychological Assessment, 10, 176-181.
cance of multidimensionality. Psychological Bulletin, 130, 80-114. Bowlby, J. (1988). A secure base (2nd ed.). New York: Basic Books. tory model. Social Science and Medicine, 45, 1715-1727.
research. American Psychologist, 63, 591-601.
thinking. Lanham, MD: University Press of America. variance structure analysis: conventional versus new alternatives. selle), Tome 1. Paris: Sindbad. (Original work published 1377). chological Association Annual Convention, Toronto. ond Annual Symposium on Refugee, Dearborn, Michigan. eling (2nd ed.). New York: The Guilford Press. Kruglanski, A. W., Chen, X.,Dechesne, M., Fishman, S., & Orehek, E.
for personal significance. Political Psychology, 30, 331-357. (Rev. ed.). New York, NY: Free Press. care settings. Annals of Internal Medicine, 122, 913-921. D) scale. 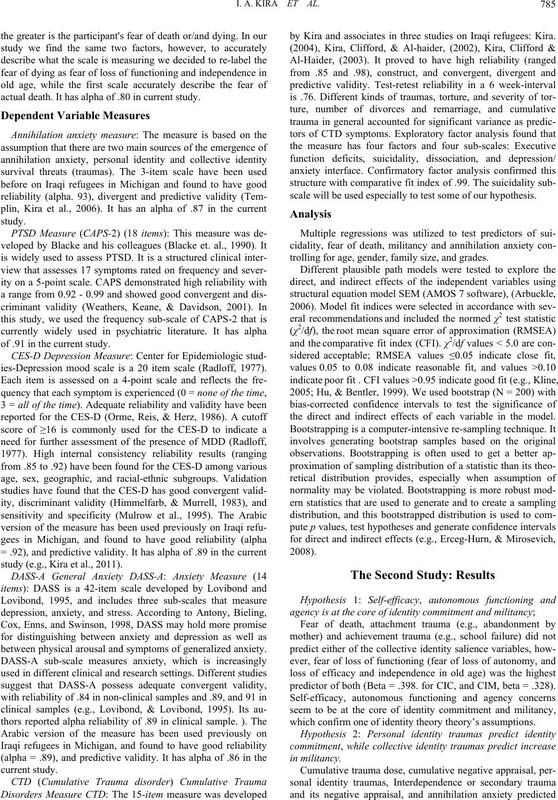 Journal of Clinical-Psychology, 42, 28-33. Navarrete, C. D., Kurzban, R.; Fessler, D. & Kirkpatrick, L. (2004). Psychology? 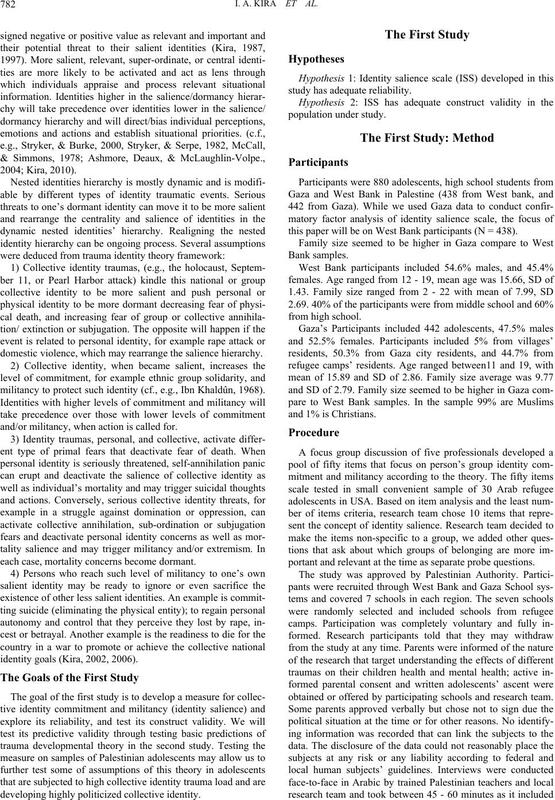 Group Processes Intergroup Relations, 7, 370-397.
identity theory. 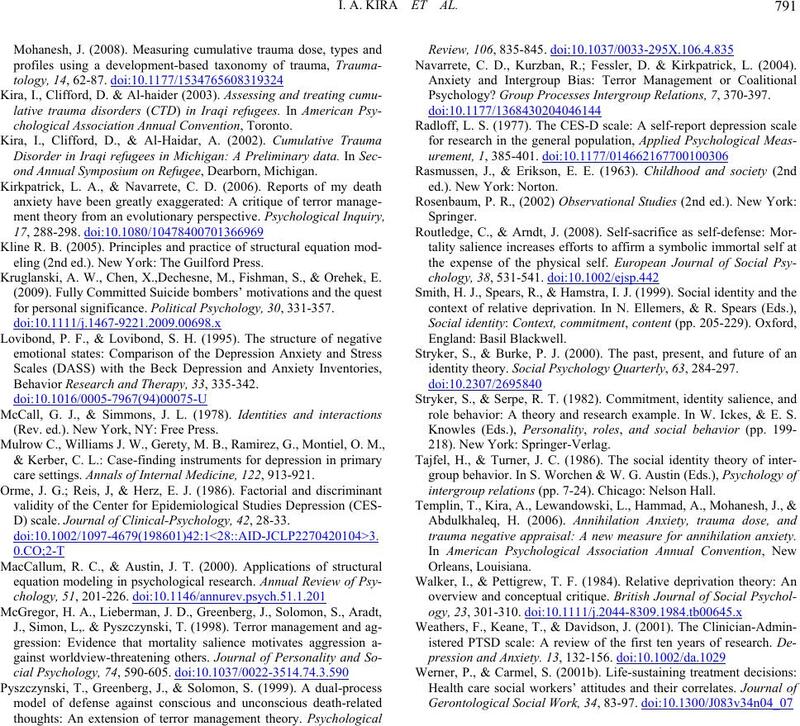 Social Psychology Quarterly, 63, 284-297.
role behavior: A theory and research example. In W. Ickes, & E. S.
intergroup relations (pp. 7-24). Chicago: Nelson Hall. trauma negative appraisal: A new measure for annihilation anxiety.